My own association with what is now the Levi Coffin House State Historic Site predates my earliest memories. The better part of my first five years was spent in the house catercorner from the old brick Federal style home where my mother’s sister and her family lived. I have memories of the old house before its sale to the state of Indiana and subsequent restoration. Some of these are vivid, some spatially faulty and some I’ve discovered are false memories due to the young age at which time they were formed. As a young fellow, I referred to the home as Mimi and Uncle Bill’s house. Mimi is officially Nancy Rupe Harrison, my mother’s sister, while Bill Harrison is Mimi’s husband. However, at the time, both adults were associated by me as Mike and Jeff’s mom and dad. These two fellow were and remain my favorite cousins, both boys one slightly older, the other slightly younger. For me, though I love my aunt an uncle, my purpose for visiting the two story structure was to engage in high-energy frolicking with Mike and Jeff. One of my strongest associations with Mimi and Uncle Bill’s house is the large back room with the forbidden stairway, and most of all, Mike and Jeff’s toys! Living across the street from on another my cousins and I were highly invested in one another’s Chrismas’. In what was part of the hotel addition, though not used by overnight guests, the back room served, at least as far was we young boys were concerned, as the place where we could play together and share toys, though I suspect chasing each other around the room was a favorite pastime until Uncle Bill or Dad would intercede with not much more than a look of displeasure. The room corresponds in length to the east side of the current structure, beyond the area used as the site’s office and lone bathroom facility, then the main kitchen area. There was an enclosed stairway along the east wall that ascended to what were the old hotel rooms on the second floor. That floor and those stairs were verboten to us boys, and being boys, both were a constant attraction and irresistible target of our imaginations. I recall a daring sojourn up the stairs and onto the long hallway that extended east beyond the current upstairs landing. The rooms on the north and south sides of the hall still displayed metal, perhaps brass, numbers. This is a memory the accuracy of which I’m quite certain, though not all of even my most vivid recollections are, I found, completely accurate. 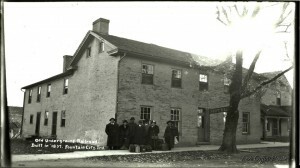 There are several recollections I have of the Levi Coffin House that have been proven inaccurate. One minor error of memory is that of time spent in the kitchen with Mimi. In my mind I continue to place the kitchen near the front, western side of the house, which is wrong. Even knowing the actual location, the picture in my mind remains unchanged despite my knowledge of where the kitchen once was. 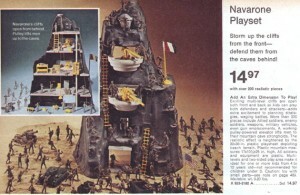 I also recall how excited I was to play in the back room with Mike’s impressive playset based upon the 1961 action film starring Gregory Peck and Anthony Quinn, “The Guns of Navarone.” The fact of the matter is, at four or five years old, none of us boys would have been old enough to have ever seen the movie. There were, of course, no movie rentals and it’s likely the first time any of us saw the movie was on the television network ABC’s Sunday Night at the Movie show during the early 1970s. The Marx Toys play set was not released until the mid-1970s. While my memories of playing with this still appealing item are correct, the location of the playing is wrong. I admit to being a bit disappointed when I learned today while seeking out the above image that the toy wasn’t produced until the mid-70s, a decade after my cousins moved to Centerville, Indiana. It was there, not the Coffin House, where I’m sure Mike, Jeff and I played with our toys, by then growing more sophisticated. When my cousins and I, doing our best Vic Morrow* stealth walk, performed our secret reconnaissance for the upstairs hall, we dared not venture beyond the recessed landing west of the upstairs bathroom and across the hall from what was once Aunt Mimi’s childhood room. In what is now the upstairs south bedroom was the living quarter of the house’s owner, my Great Aunt Nola Rupe Brittain. To the north was the house’s traditional master bedroom, the only one with a closet, Mimi and Uncle Bill’s bedroom. We boys would have been skinned had we been discovered “behind the lines,” making our adventure all the more satisfying, therefore memorable some nearly half-century later. In my next entry on this subject I’ll share what my Mom told me about the old house, correcting some recollections and confirming others and updating me on a family history of which I was not all that well versed. *Vic Morrow starred in the WWII television series, Combat!, watched by my cousins and me while living in Fountain City.